Profiles and photos of G.I. Joe figures from around the world! There are many good repaints in the Joe line. In many cases, a figure has a repaint that is either equal to or, sometimes, better than the original figure. There are many bad repaints, too. It's hard to say which more dominate the Joe line. Mostly, the domain of badly repainted figures is defined by 1993, 1994 and the 2000's as the release years. To be fair, there were few repaints prior to those years. And, those that did appear tended to be in themed subsets. In these subsets, though, you could find a poor repaint. In the case of the 1989 Python Patrol Crimson Guard, the remake of a classic figure did not translate. We are now left with a figure that doesn't make much sense, even if you can make a case for his inclusion in the popular Cobra theme. 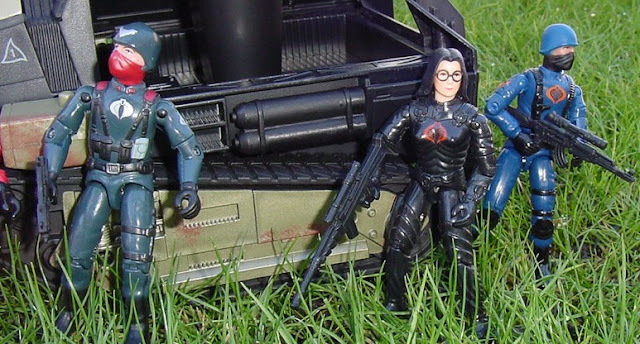 In the pantheon of Cobra army building figures, the Crimson Guard vies for one of the top spots. It's hard to see him overtaking Vipers or classic blue Cobra soliders and officers. But, he is probably of similar popularity to the BAT. You don't see the massive vintage Crimson Guard armies like you used to. But, this is a function of both the fact that Hasbro offered decent enough CG repaints in the 2000's and that many collectors are content with smaller numbers of "elite" troopers and use that to offset the quantities of other army builders they acquire. But, there is no denying the character's popularity. So, the inclusion of a Crimson Guard in the Python Patrol makes sense. By 1989, the figure had been away from retail for 3 years. And, it was likely that most kids playing with Joes were aware of the character from the cartoon or other media, but did not have his figure. So, the repaint was born. In 1989, I was out of Joe. I didn't buy the figures or vehicles. Even my youngest brother was mostly done with the toys and there were maybe one or two figures who found their way into our home. So, I didn't have much exposure to the 1989 line aside from the comic. It was here that I found out about Python Patrol. But, as the toys were far out of mind, I just found it an amusing sub plot in the comic. I never really knew that there were figures of these designs, though I assumed they would not have been in the comic did they not exist in some format. It wasn't until I started collecting again as a adult that the first Python Patrol figures entered into my collection. The Viper became a favorite as there were few options for the mold back then. The rest weren't really interesting. As the years wore on, though, the Viper lost his luster and the Python Officer became the only Python Patrol figure to hold my interest. In the early days of Joe collecting, Python Patrol were considered rarer than the original Cobra figures. In the late 1990's, it was fairly hard to find mint and complete Python Patrol figures. The only thing that kept down their prices was the fact that most collectors had zero interest in any figure made after 1987. As the Joe collecting world exploded in the early 2000's, the supply of figures that were found at garage sales, in basements or comic shops helped to saturate the market with figures. Army builders kept prices high. But, you could find as many Python Patrol figures as you wanted. As collectors began to soak up all the more desirable figures, it again became evident that Python Patrol didn't exist in the same numbers as the other, excellent, 1989 army builders. So, you saw prices rise, especially as Hasbro revisited the idea a few times. But, the subset nature of Python Patrol has always kept this team as more a group of specialists than the backbone of a Cobra army. And, that keeps the figures more available than they probably should be...even to this day. But, of the figures released under the Python Patrol banner, I find this Crimson Guard to be the worst. Truthfully, the design isn't any better or worse than most of the other figures in the set. But, since the Crimson Guard was released during the height of my childhood, I always felt they were truly elite. As a kid, Crimson Guards were the equivalent of most Joes and could beat the Joes in battle. The red color was a calling card and badge of honor. With that view of the Siegies embedded in my psyche, any rendition of the mold that was anything less than perfect was going to be viewed as flawed. So, for this Python Patrol Crimson Guard, the yellow chest and unfinished grey face simply don't hold up. The figure is non-descript when the original boldly redefined red as a Cobra color. And, with no Cobra sigil on the figure, there's nothing to tie him to the iconic first version or even the Cobra organization. So, this figure fails to really mean anything to me. I've had this version you see in the photos since he came in a lot I acquired in the late 1990's. I've never gotten another one as this one version is all I'd ever need. The upside is that you could use him to get another Crimson Guard rifle if you lost the version from your original. (The black pack is useful on Crimson Shadow Guards, too.) But, that's about the extent of his use and I have yet to find this figure as anything other than a box checker towards a complete collection. The Crimson Guard mold did not fare all that well. It was used in 1985 and then for this 1989 repaint. The mold then went to Brazil. Estrela released a version of the Python Patrol Crimson Guard there as a figure named Tocaia. This figure featured the upper arms of Copperhead. But, it is otherwise very similar to the American figure. The mold then died. Most of the Brazilian releases contemporary to the Crimson Guard also never re-appeared. They could have gone to India or been returned to Hasbro warehouses in Asia where they disappeared forever. Hasbro was so kind as to remake the Crimson Guard body in 2003. This mold was released several times. But, it lacked the vintage head and was only repainted in red and black. Factory custom makers entered the Crimson Guard arena in the early 2010's. This finally brought Cobra blue and black Crimson Guards into the community. (Along with some other flavors.) But, these figures saw low production runs and have mostly disappeared. In some ways, the Crimson Guard being held mostly true to his roots helps to maintain the mystique of the character. Though, I'd be lying if I said I would not have built an army of blue CG's had Hasbro released them in the 2000's. Python Crimson Guards have a pretty big price range. You can get mint and complete figures for around $15. But, due to low supply, dealers will often get $30 or so for them. Building an army can be done without breaking the bank. But, it will take a long time to do it. The question, though, is who wants to? A lone CG makes for a good Python Patrol commander (a role never defined) and allows collectors to maintain just one or two in their collections. The preponderance of yellow color limits the figure's usefulness and he's not a great choice for vehicles or the Terrordrome. But, as he's the only Crimson Guard repaint that's really available, the figure has value. And, with the now large quantities of Python Patrol figures that are available, it makes sense to have this CG. The weakest original Python Patroller by far. It's funny that CG's appear in Operation Dragonfire (with a slightly alerted color scheme) and so does Python Patrol, but the Python CG's do not. The mold is such, though, that even a poorly colored version is good. The colors here don't flow well. The yellow is used too much, it has both plain light grey and the dark grey python camo. The other python patrol guys use one or the other (or in Copperhead's case, not at all). Yeah, having shipped only one year, and not being available in most foreign markets, it's not surprising that Python Patrol figures are scarcer than main line releases. It's funny that the factory customizers didn't remake PP CG, but then they didn't make PP Officer, either, just ignoring Python Patrol entirely until recently. I think "Python Patrol Crimson Guard" is at least one modifier too many. Can't they just be Python Guards? That name works better for the color scheme. I don’t recall ever owning this figure in the 20 or so years i actively collected nor can I really remember seeing Python Patrol figures at retail on long island in 89. I had a couple of the Vipers back then but how I got them seems to have been lost to time or a brick or three of hash. Diorama - Shock Vipers Invade!